Have you ever had to do something that required you to use a flashlight. Maybe you’re under the car, in the attic, or anywhere else with a low-light situation. The flashlight is great for lighting things up, but it compromises one of your hands. If you set the flashlight down, you risk knocking it over or having it roll away. Instead of struggling to bring light to your job, you could simply put this headlamp on for ultra-bright, hands-free light. This headlamp is also great for dog walkers, hikers, campers, and just about anyone else who needs light and both hands. The Vericom LED 1,000-Lumen headlamp is an amazing device. First of all, the light is extremely bright because its Cree XM-L2 LED produces up to 1,000 Lumens. This is enough to illuminate nearly any situation. This light also has mid- and low-level light settings for those times you don’t need your own personal spotlight. This headlamp also has strobe and SOS modes for emergency situations. If you read this blog on a regular basis, you had to know that was coming. I have one of these headlamps and I mainly use it for night fishing. While I’ve caught nearly every species of fish, my favorite are catfish. They’re big and they put up an amazing fight, but these whiskered denizens of the deep feed at night. See where I’m going with this? Night fishing requires me to bring some type of light source to the river. Flashlights are no good because they compromise my hand or fall into the water when I set them down. Lanterns tend to get knocked over when I’m focusing on landing a gigantic flathead. (What can I say? I jump around and get excited when a fish bites.) This headlamp has proven to be the ideal, hands-free solution. Plus, it’s saved me a lot of money on having to replace lost or damaged lights. Do you own a dog? If so, you’ll probably love this headlamp. Let’s face it, when a dog has to go, it has to go… even if it’s at night. This means you’ll have to take your pooch for a walk. It might be hard to clean up after your pet with a flashlight in one hand and a dog leash in the other. Put this headlamp on and you’ll have one free hand to take care of your dog’s business, and the bright light will ensure that night drivers see you. This headlamp isn’t just for helping you see things in the dark. 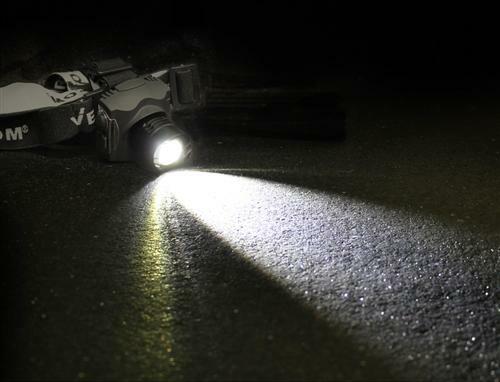 These devices also help others see you in the dark. This is a huge benefit for anyone who jogs or runs early in the morning or at dusk. A headlamp will also help keep you safe if you’re running through trails, hiking, or spending time outdoors. It’s always best to stay safe. There are so many uses for this device that it makes sense to get one for your home. Solid Signal offers this headlamp from Vericom at a great low price. Best of all, our expert team is available to answer your questions about this or any of our other products. If you’d like to know more about the Vericom headlamp, or want to place your order, give us a call at 877.312.4547. Solid Signal is your No. 1 source for this headlamp and other flashlights, lanterns, and outdoor gear. Do you need obstruction lighting on your antenna tower?